PENCIL program on 18th of May features 3 keynote talks, 5 PRIViLEDGE presentations, and 10 presentations from selected submissions. 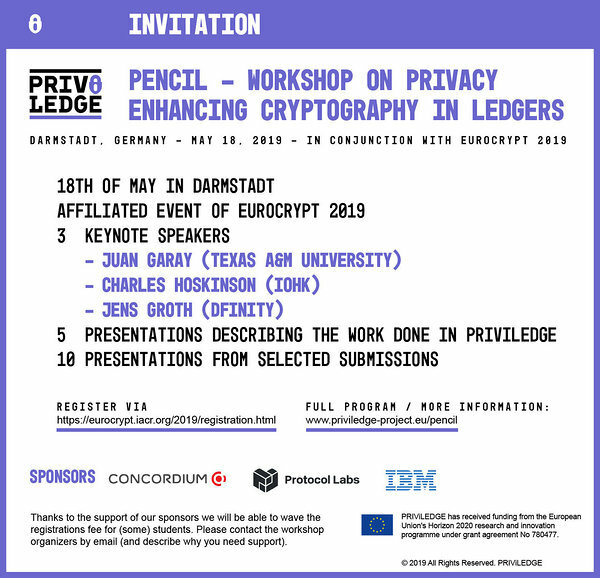 An exciting program starts with a keynote talk by Juan Garay (Texas A&M University) followed by selected presentations 'Afgjort – A Semi-Synchronous Finality Layer for Blockchains', 'Pixel: Multi-Signatures for Consensus', and 'A Framework for Anonymous Lottery-Based Protocols in the Proof-of-Stake Setting' before the coffee break. The second keynote is given by Charles Hoskinson (IOHK) and after that comes the first PRIViLEDGE session with 3 presentations: 'Asymmetric Distributed Trust' , 'Publicly Verifiable Proofs from Blockchains and the Attacks of the Clones in Proof-of-Stake Blockchains' and 'Timed Signatures and Zero-Knowledge Proofs - Timestamping in the Blockchain Era'. Third keynote by Jens Groth (DFINITY) comes after the lunch and is followed by presentations 'Fully Homomorphic NIZK and NIWI Proofs', ' Zether: Towards Privacy in a Smart Contract World' and 'ZEXE: Enabling Decentralized Private Computation'. The second PRIViLEDGE session has talks on 'On QA-NIZK in the BPK Model' and 'Verifiable MPC and DLT'. The final session has 4 presentations: 'Quisquis: A New Design for Anonymous Cryptocurrencies', 'Initial Public Offering (IPO) on Permissioned Blockchain using Secure Multiparty Computation', 'Universally Composable and Privacy-Preserving Audit Logs Using Bulletin Board', and 'Bootstrapping Online Trust: Timeline Activity Proofs over Public Ledgers'.